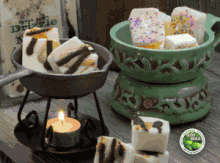 Drizzle MeltsTM are a wonderful collection of tempting products from Swan Creek Candle Company's(R) Collection. Enticing not only to your olfactory and visual senses, but also your sense of value for these pleasingly-priced new offerings. And they are so easy to use with six separate break-apart cubes - just place them in a melter and enjoy! Please note our 5.25oz break apart Drizzle Melts are either an Herbal Design or a Drizzle Design however all melts are made of the same triple scented soy wax, and the finish is purely decorative and does not have any effect on the fragrance or throw.